Accent RAR Password Recovery – is the professional solution for recovering lost passwords to RAR and WinRAR archives. The search algorithm is uniquely optimized for all modern AMD and Intel processors, and the software supports GPU computing on AMD and NVIDIA graphics cards. All this power comes with a surprisingly simple interface. With Accent RAR Password Recovery, it�s fast and easy to retrieve passwords like a pro. 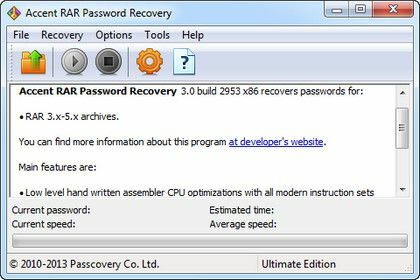 Accent RAR Password Recovery supports RAR3 format and can easily recover passwords to archives created in other versions of WinRAR, all the way back to WinRAR 2.90. Accent RAR Password Recovery uses AMD and NVIDIA graphics cards to boost search speeds up to 40* times faster on each card. The software uses GPU technology to retrieve passwords for all supported archives. The power of modern graphics cards gives an incredible performance boost, and their flexibility, scalability and affordability make AccentRPR the optimal solution for recovering lost WinRAR passwords.